Claggett Creek Middle School didn’t look like a first-year program as it dominated Independence on Saturday, June 2 at McNary High School. Scoring four goals in the first half and eight in the second, the Panthers won 12-0 in the final game of their first regular season. Eighth grader Aron Montoya, one of Claggett’s two captains, scored the Panthers first goal in the opening seconds. The other captain, Jorge Ruiz, then put CCMS up 2-0. Goals by Xavier Grantham off a corner kick and Sage Allen gave the Panthers a 4-0 lead at intermission. Ruiz then started the second half with three straight goals to give CCMS a commanding 7-0 advantage. A header by Alejandro Alvarez-Perez with an assist from Angel Vargas made the score 8-0. After a Ray Pacheco goal stretched the lead to 9-0, Adair Barocio scored the final three goals. Goalkeepers Ramirez (first half) and Allen (second half) combined for the shutout. 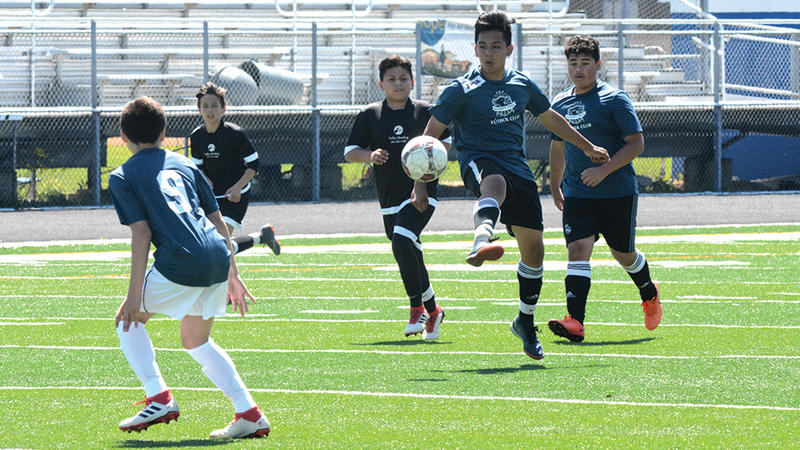 Playing in leagues through the Salem-Keizer Education Foundation and the Keizer Soccer Club, the Panthers finished the regular season with nine wins, two losses and one tie. Both losses came to the 4-H Timber Juniors. CCMS will play in Keizer Soccer Club’s six-team playoff on Saturday, June 9 at 1:15 p.m. at Whiteaker Middle School with the winners advancing to the championship on Sunday. Although it’s the first season all of the Claggett kids have played together on one team, the boys have built chemistry together in other sports.